Even relatively stable Europe hosts its share of geopolitical tensions: Catalonia, a major region of Spain which has long claimed a unique national identity, may now be on the path towards independence. Read on for a profile of what could become one of the world's newest countries. 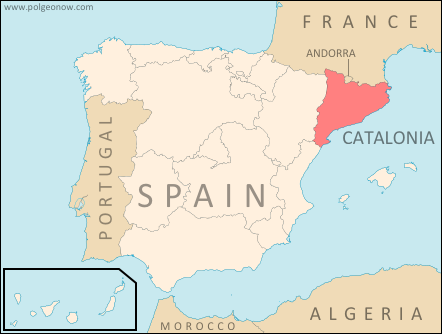 Catalonia is an autonomous community of Spain. It holds the official status of a nationality within the Spanish parliamentary monarchy. Regions of Spain with this status are considered to be something similar to countries within the larger Spanish nation, allowing for their own separateness from Spanish mainstream culture without actually being considered independent. The region’s political administration consists of four provinces and extends over a large part of the historical Principality of Catalonia, which also included a piece of what is now southern France. Its capital is Barcelona, the largest city in Spain after Madrid and the sixth-largest in Europe. Catalan, Spanish, Aranese Occitan and Catalan Sign Language are all officially recognized languages. Early in Catalonia’s history, it was ruled by Greeks, Carthaginians, the Romans, the Visigoths and the Islamic Moors. After a period of Frankish administration, the region would become a self-governing principality, ruled by the Count of Barcelona under the Crown of Aragon. It was during this time that Catalonia began producing a uniquely Catalan culture. The principality unified with the Crown of Spain but maintained self rule. During the War of the Spanish Succession, King Philip V brought an end to Catalan self-rule, incorporating it fully under the Spanish monarchy. In the 20th century, Catalonia would have varying degrees of cultural independence. After the Spanish Civil War, military leader Francisco Franco banned Catalan language and culture. After World War II, Spain would see booming economic growth (the so-called the “Spanish Miracle”) with Catalonia both contributing to and benefiting from this rapid growth. With the end of Franco’s rule came the transition from dictatorship to democracy, which resulted in Catalonia being granted political, cultural and linguistic autonomy under the Spanish constitution. Though calls for Catalan independence arguably have older origins, the formation of pro-independence political parties began early in the 20th century and continued during the oppressive rule of the Franco regime. Along with political parties, armed groups came into existence, some of which were considered by the Spanish authorities to be terrorist organizations. Terra Lliure, the Catalan Liberation Front and the Catalan Red Liberation Army were some of those organizations. By the 1990s, however, many of them had been disbanded. Decades later, the global recession hit Spain particularly hard, and the economic downturn has rejuvenated Catalan nationalist aspirations. While the Catalan national holiday of Diada de Catalunya usually draws crowds of people no larger than 50,000, 2012’s celebration brought an estimated at 1.5 million. While polling suggests that only 25.2% of Catalans wanted outright secession from Spain in 2010, a surprising 51.1% wanted the same thing in 2012. The situation is further inflamed by a dispute between Catalonia and the Spanish federal government: 19.49% of Spain’s tax revenue comes from Catalonia, but only 14.03% is reciprocated by state spending. In November of 2012, Catalans voted in an election which gave pro-independence parties the majority of seats in the Catalan government. These parties wish to hold a referendum on independence for the region. How would Catalonia fare if it were to become an independent country? The new nation would have a population of 7.5 million people, making it the 99th most populous country or territory in the world. The total land area of the country would be 32,114 km2, making it the 140th largest country or territory. The gross domestic product of the Catalonia region is US$314.4 billion, which would make it the 34th largest economy in the world if it were independent today. 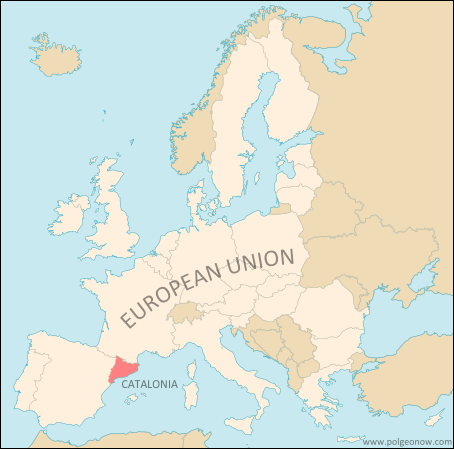 If it were granted membership in the European Union, the economy of Catalonia would be the bloc’s 14th largest. Spain would be a loser in this transition in more ways than one. To begin with, it would lose approximately 16% of its population. Approximately 6.3% of Spain's territory would be lost as well, and its GDP of US$1,494 billion would be reduced by 21%. On top of it all, the federal government would lose an important region from which significant state revenues are generated. Other than the need to recover from economic troubles affecting all parts of Spain, there might be several issues faced by an independent Catalonia. What would be the cultural identity of this new country? Catalonia is not a homogenous region and many (46.53%) speak primarily Spanish, over Catalan and other languages. Though a majority now supports partition, a large minority of citizens do not necessarily support independence and may not react well to such a separation. Were Catalonia to become an independent state, such an important political move being supported by such a slim majority might prove to have a destabilizing effect. Finally, the assumed admission of this new country into the European Union is just that: an assumption. Political partitions do not tend to go over smoothly, so Catalonia’s separation from Spain could foster a lot of resentment from non-Catalan Spaniards inside and outside of Catalonia. Since current EU members must all agree on the admission of new states to their union, a resentful Spain might block such an attempt at admission, which would certainly have political implications as well as possible economic effects. Graphic of current Catalonian flag by Wikimedia Commons user Martorell (License: CC BY-SA; source).